ePublishing Knowledge BaseePublishing Knowledge BaseePublishing Knowledge Base Creating, Managing, and Selling Products How do I use the price classifications when creating a product? To present discounts for subscribers. For example, if your reader is logged-in, he will see the discounted price or that the product is free. If he is not logged in, he will see the full price. To drive bulk event registrations by the company or the table. To work with specific Circulation and Fulfillment companies. NOTE: Presently, this only impacts you if Multipub fills this role for your site. Classifications are found under Pricing Options on the first page of your product. 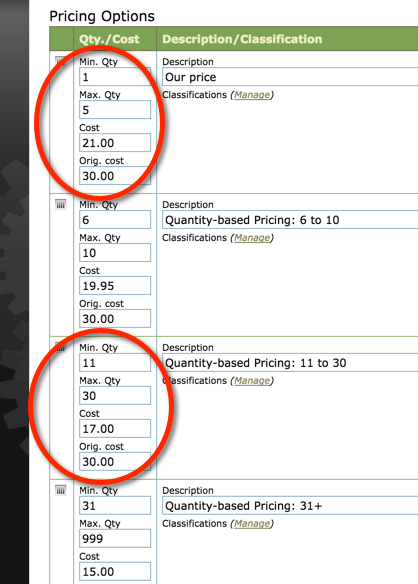 Zoom: Classifications are found under Pricing Options on the first page of your product. Find the Product Manager under Sales/Marketing on your dashboard. Classifications are set up by your ePublishing Solution Manager. If you have questions, please contact your Solutions Manager. Here's an example of a classification used to show a price of $0 when subscribers are logged in. To tag this price with a classification, click Manage. 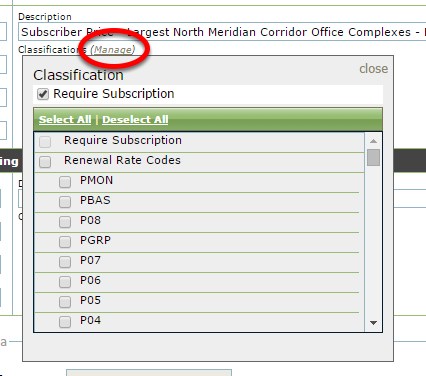 Click the box next to the relevant classification. In this case, it's: Require Subscription. Classifications are unique to your website. Add a pricing option for each quantity-based price. Set the minimum and maximum quantity needed for the given price. Cost is the per unit price based on the quantity. Original cost allows you to show a list price discount on the product page. Prev: How do I change the “Thank You” messages that appear on my website's order confirmation page? Next: How do I create an event product?